Chia Seed Oil 100% Pure Unrefined Pharmaceutical Grade product is Unrefined, which means it is in the purest form that it can possibly be in. Relatively unknown in North America until recently, Chia Seeds have been a staple food in Mexico for centuries. Chia seeds come from a species of flowing plant in the Lamiaceae (Mint) family and have been highly valued as an endurance promoting food by the Mayans and Aztecs since ancient times. A rich vegetarian source of omega-3, antioxidants and bone building minerals. 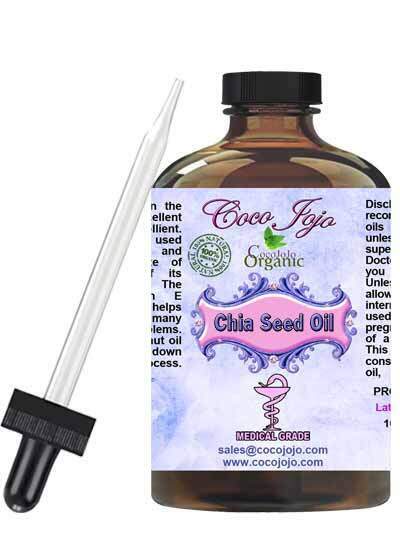 The oil extracted from Chia seeds has incredible beauty benefits, too. Not only are they rich in precious omega-3 fatty acids ? they’re also good bet for restoring vital moisture. For an instant S.O.S. for thinning lips, try massaging a lip plumper on and around the contours of the lips. Allow to dry shortly and follow with Chia Serum. Your lips will appear less lined, more full and well hydrated.